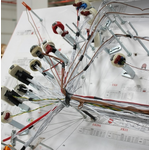 manufacturing wire-harness & cables for assembly lines for bus, minibus,air-condition& heating-cooling system manufacturers,..
We are located in Istanbul Turkey. We are manufacturing wire-harness and electrical cables for Bus, Tractors, Agricultural machinary, Excavator-loaders, trucks assembly lines and cabin manufacturers. Total Number of workers, 248… 12.000 sqm closed area. 12 engineers working in R&D department. On-time delivery & is our motto as we are supplying to assembly lines.